No one is sure how a “cup of Joe” came to mean a “cup of coffee” but the source of a different nickname for the popular brew is clear. 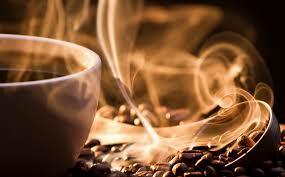 When coffee became popular in the 19th century, the primary source of those magical beans was in Indonesia, on the island of Java. 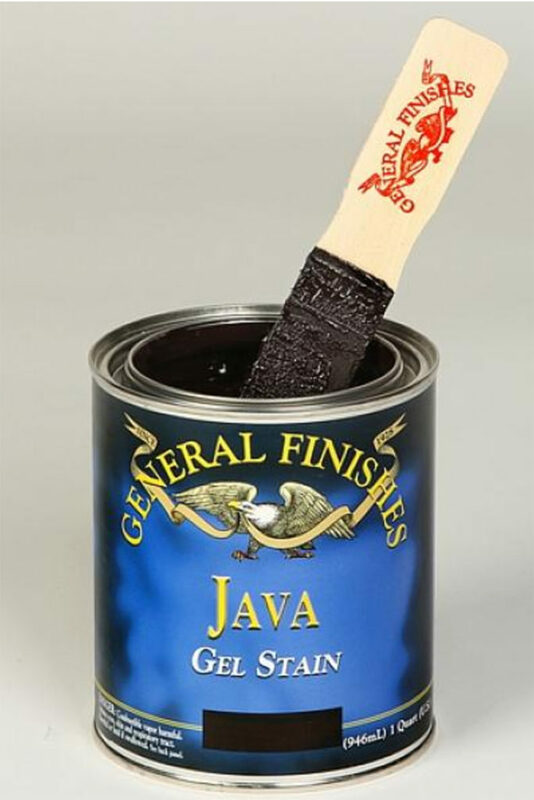 You’ll never confuse a can of Java Gel Stain with a cup of coffee. I had anticipated something like dark jelly, but it was more like sludge. But hey, I’d had three babies. There were worse things than sludge. It was time to sludge a table. 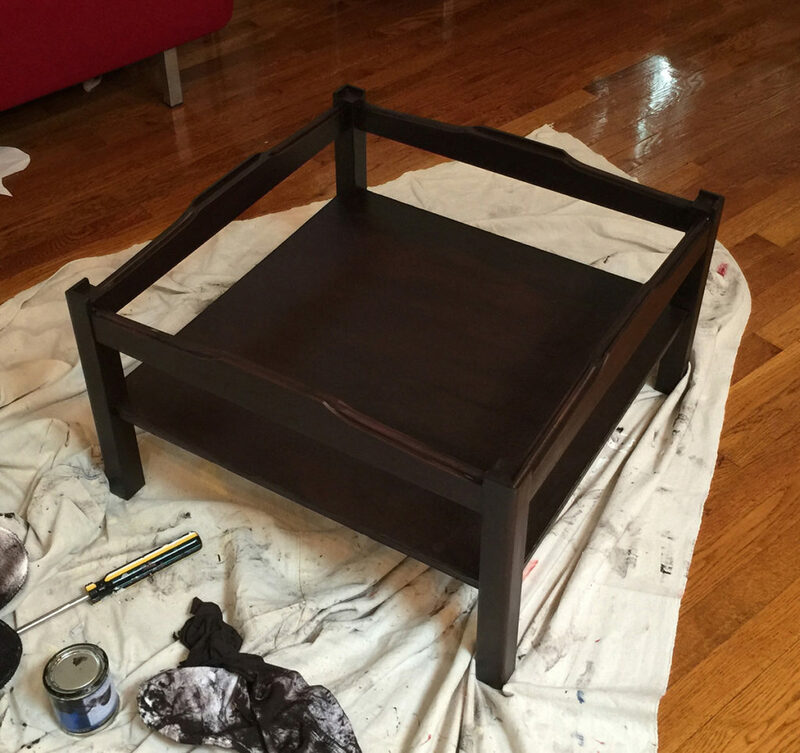 The materials and construction of the table I had were Ikea-like, but it looked like it had been assembled before Ikea had been born. 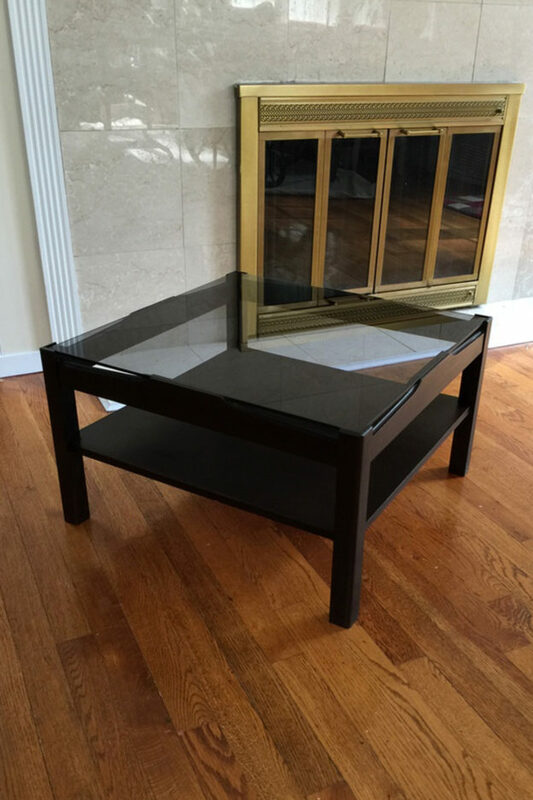 It was sturdy little thing and had the advantage of a smoked glass top that was in pretty good condition. I had to be extra careful with that glass because if I broke it, the table wouldn’t be worth saving. This was a total, off the cuff experiment. I mixed the primary colors, Napoleonic Blue, Emperor’s Silk (red) and English Yellow. I thought this combination of colors would make brown. Good theory. Yucky color. I wasn’t going to waste the paint I mixed so I used the yuck as a base. 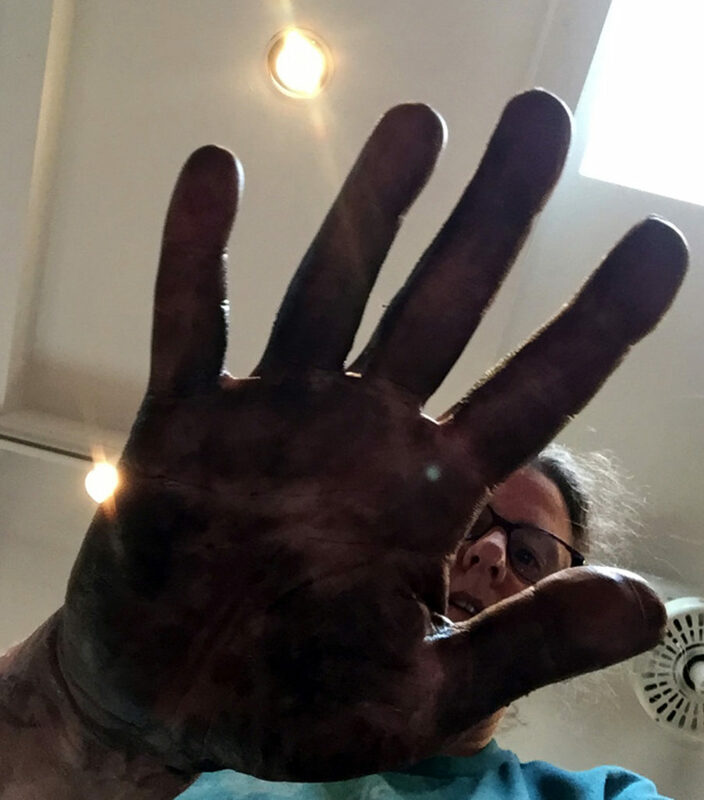 Continuing on in ignorance, out came the Java gel stain. What a mess! I wiped it on with one rag wiped it off with a clean one. I didn’t seem to have much control as far as how much came off. I had to keep reapplying stain to the bare spots. I was in serious need of a cup of Joe, but didn’t dare approach the spoon, the coffee, the pot or the cup. In retrospect, I should have applied less stain and used lighter touch as I removed it. Proof that I had applied too much was the frustrating fact that the stain took two days to dry. The table didn’t looked stained but it looked better in brown. The particle board couldn’t have been concealed more thoroughly. No waxing or sealing, just a whole lot of mineral spirits to clean my hands. 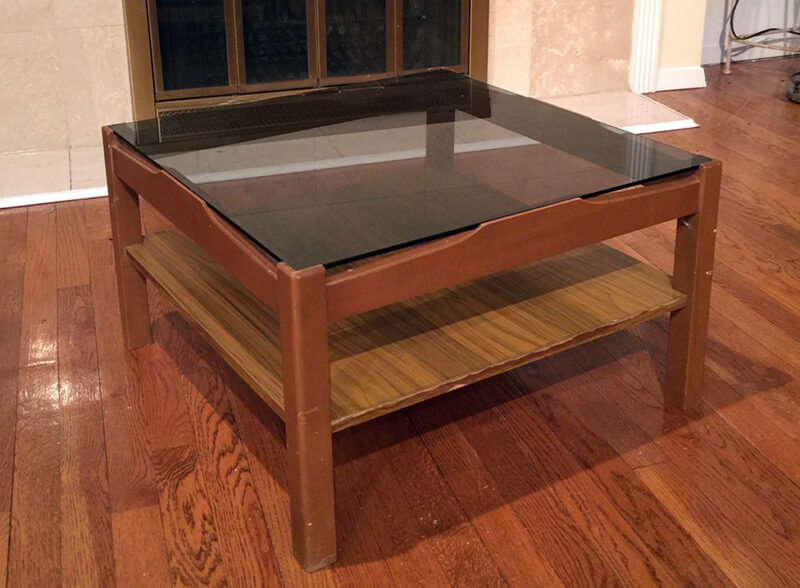 Quite a nice coffee table, I think. Care for some Java? The color of the basecoat matters. Use light strokes when wiping off the stain with a rag. Java is an island, a word for coffee, and the name of a color. 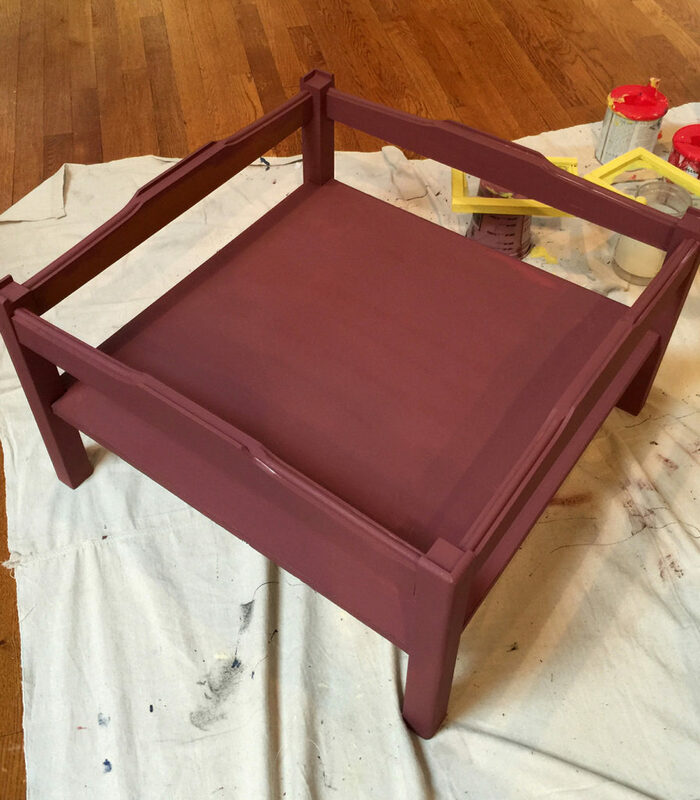 This entry was posted in Furniture, Musings and tagged Annie Sloan, chalk paint, coffee, craft, crafting, furniture, gel stain, Java, Karen Rae Levine, paint, painting, refinish, refinishing, refurbish, refurbishing, repurpose, repurposing, stain staining, Suite Pieces on November 18, 2016 by Karen Levine.